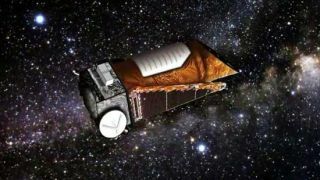 NASA's planet-hunting Kepler Space Telescope has begun its extended mission, which should keep the prolific instrument searching for alien worlds for another four years, agency officials announced today (Nov. 14). Kepler officially embarked upon the extended mission after completing its 3 1/2-year prime mission, which aimed to determine how common Earth-like planets are throughout the galaxy. The extended phase, which NASA announced this past April, funds the instrument through at least fiscal year 2016. Kepler is staring at more than 150,000 stars continuously. It detects exoplanets by noticing the tiny brightness dips caused when they transit — or cross the face of — these stars from the telescope's perspective. Kepler has already made a series of impressive discoveries. Since its March 2009 launch, the telescope has detected more than 2,300 exoplanet candidates. Just 105 of them have been confirmed by follow-up observations to date, but the Kepler team estimates that at least 80 percent will end up being the real deal. Confirmed discoveries include Kepler-10b, the first unquestionably rocky planet ever found beyond our solar system, and Kepler-22b, a world 2.4 times larger than Earth that orbits in its star's habitable zone — that just-right range of distances where liquid water could exist. And the Kepler candidates include hundreds of Earth-size worlds, as well as a number of habitable-zone planets. "The initial discoveries of the Kepler mission indicate at least a third of the stars have planets and the number of planets in our galaxy must number in the billions," Kepler principal investigator Bill Borucki, of NASA's Ames Research Center in Moffett Field, Calif., said in a statement. "The planets of greatest interest are other Earths, and these could already be in the data awaiting analysis. Kepler's most exciting results are yet to come." The $600 million Kepler mission is a big part of the burgeoning field of exoplanet science, which is compelling many people to reassess humanity's place in the cosmos. Scientists with many different research teams have already confirmed more than 800 alien planets since the first was found around a sun-like star in 1995. "The Earth isn't unique, nor the center of the universe," said veteran planet-hunter Geoff Marcy, a professor of astronomy at the University of California, Berkeley. "The diversity of other worlds is greater than depicted in all the science fiction novels and movies. Aristotle would be proud of us for answering some of the most profound philosophical questions about our place in the universe."